Fall Cake Pops is rated 5.0 out of 5 by 1. Rated 5 out of 5 by Hema CP Movva from Awesome cake pops! I ordered cake pops from gourmetgiftbasket 10 days ago for a brother. The cake pops were delivered in neatly packed wrappers. My brother said they were yummy. 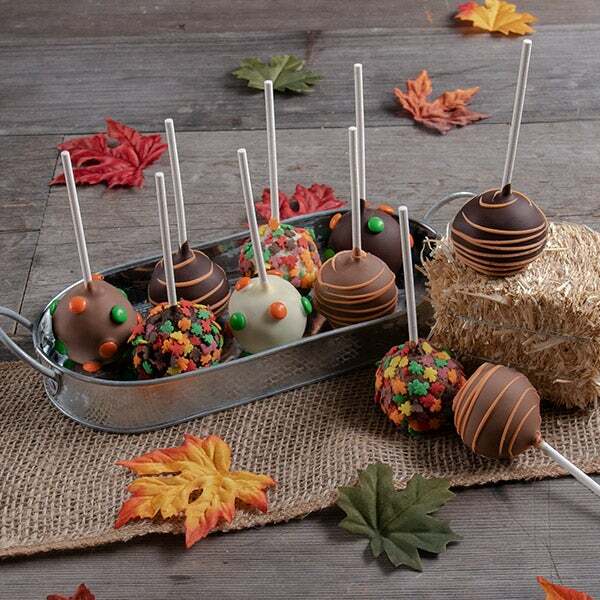 These elegant cake pops are the perfect treat for any celebration this autumn! We've taken our signature vanilla and chocolate cakes, rolled them into perfect balls, and gently dipped each one into baths of rich imported Belgian chocolate. Each delicious treat is then elegantly embellished using leaf-shaped sprinkles, a sweet confectionary drizzle, or festive fall candies.